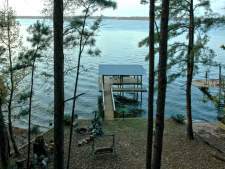 ...to your retreat on the shore of beautiful Toledo Bend Lake. Centrally located on Lanan Bay just off the main body of the lake, Y Knott Lodge is within minutes of Pendleton Bridge, world-class Cypress Bend golf course, and Toledo Town with a fishing tackle superstore, real estate agents, banks, restaurants, supermarket, gas and convenience stores,and more. Smoking is absolutely NOT permitted inside. 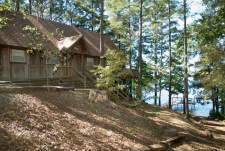 Snuggled into the woods overlooking the lake, you'll enjoy this quiet area with plenty of privacy. You can enjoy the first light of dawn and relax at the end of the day looking out over the lake from the large deck or from the comfort of the Great Room. The great, mid-lake location on the Louisiana side of Toledo Bend puts you close to the action for major fishing tournaments - many launch from Cypress Bend or San Miguel Parks - just minutes away. Grill steaks or the day's catch on the large deck overlooking the lake. Your boat is always convenient in the private boat house and you may enjoy fishing from the bulkhead or dock in the evening or at night - the boat house is well lit and there are outlets to plug in your boat batteries. Bring some food and fishing rods... the rest is waiting for you here! 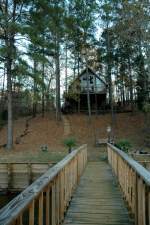 We would like to thank you for inquiring about The Y Knott Lodge on Toledo Bend. We take great pride in the upkeep and appointments of this home; we are sure you will enjoy it as much as we do. We will continually improve and add to the amenities of this home to make your next stay even better. 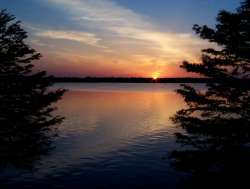 We look forward to having you visit us to fish, relax and enjoy this beautiful area of Toledo Bend Lake.